Happy new year, physical therapists! We're so thrilled to be a part of the PT community, and want to take a moment to thank you all for your support since we launched :) Personally, I'm not big on making new year's resolutions, but I do typically try to set some intentions for the new year. 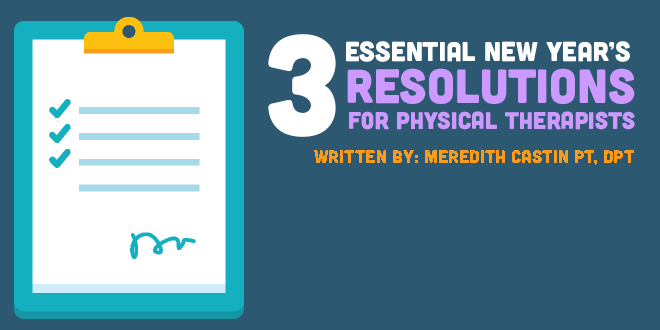 I wrote this article with new grad physical therapists in mind, but any PT can benefit from these resolutions/intentions, or anything else you can call them. Enjoy! I cannot tell you how many new physical therapists have complained to me that they feel incompetent when a patient isn't improving as quickly as they had expected. Your interventions are only one aspect of a patient's recovery trajectory. We all learned this in school, but sometimes we have to step back and remind ourselves that patients' co-morbidities, genetics and compliance levels can be just as influential as your techniques or instruction, when it comes to their recoveries. When I was a new grad, I noticed that I could be over the moon one day and totally frustrated the next, and a lot of that had to do with how well my case load was recovering. While constant improvement is vital to physical therapists, internalizing factors that are only partially under your control can take a toll on your confidence and overall job satisfaction. Difficult patients are a fact of PT. They will sometimes make you question your worth, but try to avoid falling into this trap. Notice that I didn't say, "Take a continuing education class that inspires you." Sure, for many readers, an inspirational class IS a continuing ed class. Not for everyone, though. Do you find coloring relaxing? Consider a drawing or painting class. Do you enjoy cooking? Take a cooking class! A class doesn't have to be a 6-12 week course where you become an expert in glass blowing. That kind of commitment to a class can be daunting and quite expensive if you're trying to pay off prevent physical therapy burnout is to make sure that you have non-clinical outside interests that you pursue. If you make your work your life, things get very boring, very quickly. After the thrill of the holidays, returning to work can feel like a bit of a letdown. Take a moment to assess where you feel least confident at work: Is it your communication skills? Your clinical skills? Time management? Use the new year as a time to physical therapy specialization or certification, and start making strides towards that goal. Clinical growth aside, wherever you feel weakest in work, make the point to learn a few hacks to improve your daily flow. If your back is constantly achy, ask some older colleagues for tips to use during transfers or manual therapy. If you're always taking your paperwork home, consider giving your higher-level patients 5 more minutes of exercise, where you would have done manual. New grads sometimes overdo it with manual therapy because we're so excited to use our skills. Don't forget that we're also movement experts, and we want our patients as active as possible. You can use an extra 5 minutes per patient to get caught up on documentation, while ensuring that your patients progress from more dependent on you to less so. Happy new year, everyone! Wishing you all a fun-filled, successful, and healthy 2018!